NAFTA talks break off, again. Now what? NAFTA talks have probably missed the latest in a string of deadlines, leaving all eyes on the United States over what will happen next. 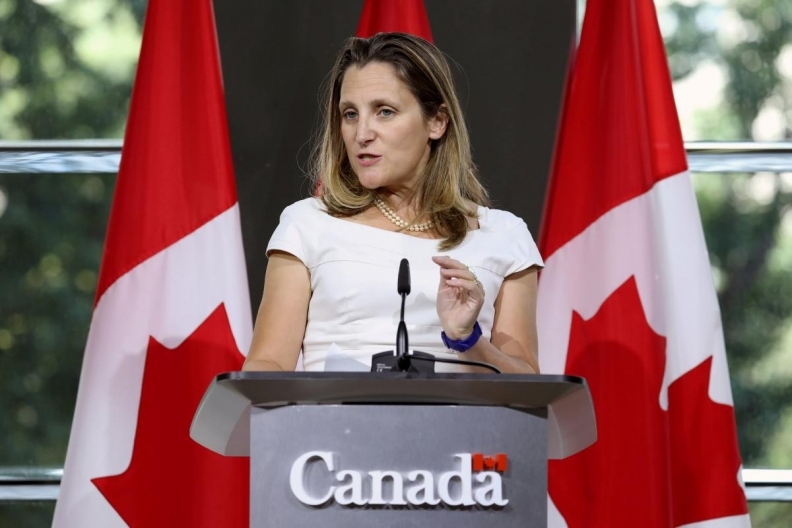 Canadian Foreign Minister Chrystia Freeland and U.S. Trade Representative Robert Lighthizer met Thursday in Washington, negotiating while Unifor President Jerry Dias stood outside and sounded the alarm over deal-breaker issues. Thursday was considered by some to be the deadline to get a deal to satisfy a target the U.S. has been shooting for. "We discussed some tough issues today, the atmosphere continues to be constructive, and we continue to work hard towards a deal," Freeland told reporters. She was asked whether they were making progress, and replied: "I chose my words carefully: Today we discussed some tough issues, the conversation was constructive." The two countries remain in a phase of continuous negotiation, Freeland said, amid a crowded calendar. She will be in Montreal for a meeting with foreign ministers Friday, and in New York next week for the opening of the United Nations General Assembly. She didn't say when she'd next meet Lighthizer and brushed aside questions of deadlines by saying her only goal is getting a good deal: "We continue to be guided by that single metric." The sides want to sign an accord before Mexico's incoming president, Andres Manuel Lopez Obrador, takes office Dec. 1. To do so, they'd have to publish a deal by Sept. 30, and would need to reach agreement imminently to have time to put it into legal text. Talks could continue. Freeland said she and Lighthizer will remain in touch. It's not entirely clear how long it will take to put an agreement into legal text; a deal reached next week could conceivably still meet the Sept. 30 deadline. Talks could continue past Sept. 30. In this scenario, the countries may simply extend talks, meaning it would likely be Lopez Obrador who would have to sign any eventual deal on behalf of Mexico, which has a tentative agreement with the U.S.
Trump could pull the plug. The U.S. has threatened to proceed without Canada if a deal can't be reached. That would almost surely mean a fight with Congress, and Trump has warned he might give notice of quitting the current North American Free Trade Agreement and apply auto tariffs on Canada. 'We're totally happy to have Canada join if they wish, and if they don't, we will go ahead simply with Mexico," Commerce Secretary Wilbur Ross told CNBC's "Squawk Box" on Tuesday. Which of those will transpire is unclear. A spokeswoman for Lighthizer did not respond to a request for comment Thursday, and Lighthizer declined to answer questions from reporters. "I remain very optimistic that you will get a deal" at some point, Eric Miller, a Washington-based trade consultant with Rideau Potomac Strategy Group, told BNN Bloomberg television on Thursday. "The Canadian approach has always been that we won't be bound by deadlines, we will be bound by substance." The sides remain at odds on a handful of issues. Canada is seeking some kind of guarantee that, if a deal is reached, it won't be hit with the auto tariffs that Trump is threatening. Dias said it's a sticking point. "Why would Canada sign a trade agreement that deals with all the important issues and then have Donald Trump impose a 25 per cent tariff on automobiles?" he told reporters in Washington, speaking outside talks. The latest talks have also hinged on dispute panels meant to handle anti-dumping and countervailing duty cases. The U.S. wants to kill the panels, enshrined in Chapter 19 of the current NAFTA, while Canada wants to keep them in some form. It's a tough issue because it's "a fundamental issue of principles," Miller said. The countries are also discussing one of Canada's key bargaining chips, dairy concessions, which has angered farmers in the country. Meanwhile, the United States is getting "very, very close" to having to move forward on its trade deal with Mexico without Canada, White House economic adviser Kevin Hassett said on Friday. There is just over a week to go before an Oct. 1 deadline to publish the text of a deal to update NAFTA and the United States and Canada have still not agreed on terms, Hassett told Fox News Channel. "We're still talking to Canada, and we're getting very very close to the deadline where we're going to have to move ahead with Mexico all by themselves," said Hassett, who chairs the White House Council of Economic Advisers. "I'm a little surprised that the Canadians haven't signed up yet," Hassett added. "I worry that politics in Canada is trumping common sense because there's a very good deal that was designed by Mexico and the U.S. to appeal to Canada. And they're not signing up and it's got everybody over here a little bit puzzled."